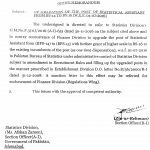 Government of Pakistan Establishment Division has issued Notification No. 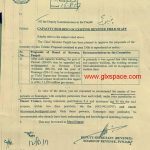 No.8/34/2011-R.1 dated 23-09-2014 in connection with Upgradation of Technical Assistant & Field Enumerator from BPS-11 to BPS-14. 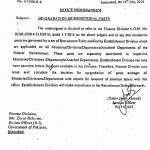 Up-gradation of the posts of Technical Assistant and Field Enumerator from BPS-11 to BPS-14 by enhancing the prescribed educational qualification for the post to Graduate with two years experience in relevant field subject to concurrence of the Finance Division, amendment in the Recruihent Rules and filling up the upgraded posts in the manner prescribed in this Division's O.M dated 31-12-2008 in all the Federal Ministries/Divisions/Departrents. 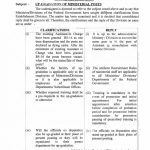 The up-gradation of the existing incumbents of the posts of Technical Assistant and Field Enumerator presently working in the Federal Ministries/Divisions/Departments as one time dispensation. I m technical assistant B-15 in Education Deptt Sindh Govt. My Qulification is M.Sc (Elect). 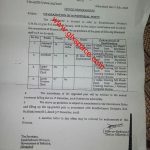 I m engineer supervisor in National telecom and I m eligible for that post bps 14.
ye aap per apply hota keu k NTC k technical engineer supervisor b is me aatay hay.you are eligble. 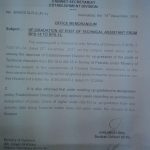 Madam meri technical post hay telecommunication me.kia ye technical assistan kohee aur post hay. 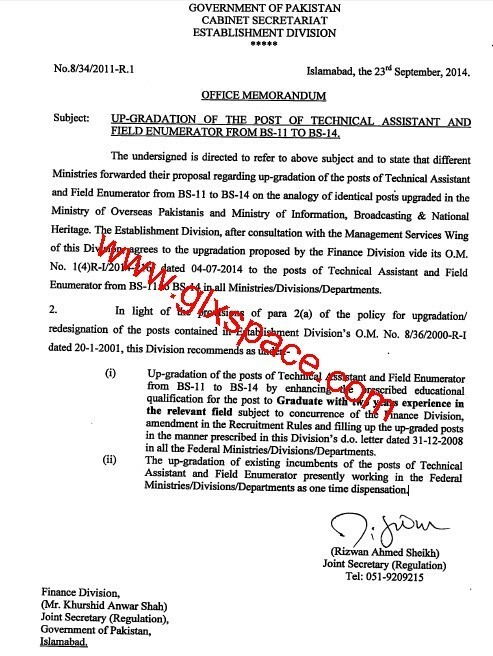 Dear Abdul Sattar it is only Technical Assistant Post. Dear Abdul Sattar You must contact ur department. I think you are not included in it. fgei teachers ki new upgraded list KB tk aanay k chance hain. Dear Muhammad Asif In Sha Allah jald chances hain.